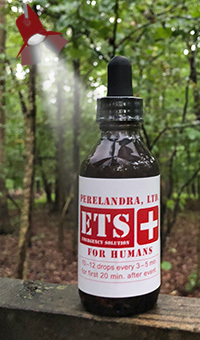 Spotlight: ETS for Humans - Perelandra Ltd.
Perelandra's ETS for Humans is the perfect solution that fits everyone's needs for any sudden or "unscheduled" physical, emotional or mental situation that can be large or small, serious or passing. It's for all those events that can occur throughout our day that we don't plan for, would have appreciated not happening, and that cause anger, frustration, confusion, pain, panic, irritation, and fear. When these kinds of "intrusions" occur, we immediately reach for and take ETS for Humans. Once we stabilize ourselves with ETS, we are better able to intelligently and calmly turn our attention to what else we need to do to address what has just occurred. Climate change has you depressed and/or scared. The summer is ending and the kids are overwhelmed with going back to school. The news is so bad you're afraid to turn on the TV. You decided that the only way to deal with the chaos of summer is to lay outside in a chaise lounge the entire day with a gin and tonic, and now you're sunburned and hungover. ETS for Humans is available in 1/2-oz. and 2-oz. dropper bottles, and 8-oz. refill bottles. A 2-oz. bottle contains about 100 doses (10-12 drops per dose).